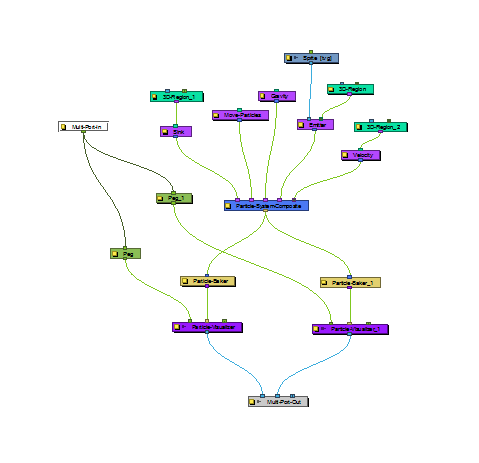 This module, also known as the Particle-Baker, allows you to make decisions about the particle systems position, angle, number, etc. the same way that a baker would make decisions about the ingredients that go into baking a cake. 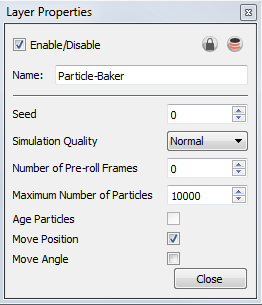 The Baker performs the particle simulation, combining together all the ingredients specified to get the final result. The Baker must always be connected to the Particle-Visualizer. Use the Particle Baker's Layer Properties to adjust your particle system's various parameters. • Seed: This value allows you to apply a random effect to the particle system. There may be times when you want to copy the particle system to two different locations on your screen. You can take the out port of the Particle System Composite module, and plug this into two separate Bakers and Visualizers. 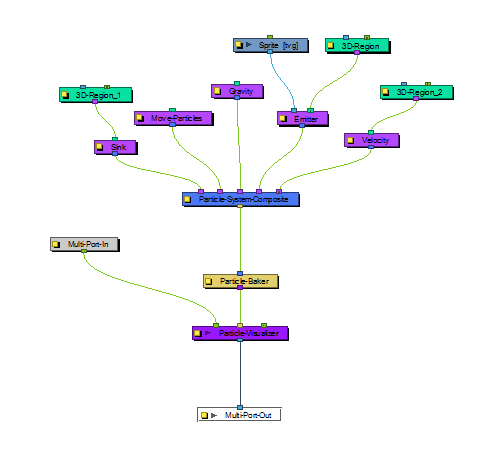 Then you could move one system over by attaching a peg into the left side of one Visualizer. If you do this, the two systems will look exactly the same. Add a random Seed to make them look different. • Simulation Quality: This option defines how many simulation steps per frame are performed. The lowest quality creates one step per frame. Raising the quality will divide the simulation time and create two or more steps of simulation for each frame. This increases the computation time, but also increases the quality of the result. • Number of Pre-roll Frames: Allows you to select a start position in the particle effect sequence, other than the start (generation) of the sequence. This essentially allows you to start the particle effect part-way through its cycle, even if it starts on frame one of your project. An example of when this parameter might come in handy is when you want it to be already raining at the start of your scene. If you don't change the number of Pre-roll Frames, it will always start to rain at the beginning of your scene. • Maximum Number of Particles: Entering a value in this field puts a cap on the number of particles that will be created; the software will stop generating particles once it reaches this number. • Age Particles: Check this option if you want the software to keep track of how long a particle has existed in its cycle from the time of its inception. Knowing a particles "age" means that you can tack other parameters onto its lifespan, such as having the particle start to disappear or change colour at a certain age. • Move Position: Check this option to allow the particles to move position, otherwise the particles will not be able to flow in a specified direction. This option also exists in the Move Particles module. You do not always need a Move Particles module, hence why this option exists in the Baker. This option is also useful for when your Move Particles module is cut-off by a sink, refer to Sink for information on that particle effects module. • Move Angle: Check this option to allow the particles to flow from different angles. This option also exists in the Move Particles module. You do not always need a Move Particles module, hence why this option exists in the Baker. This option is also useful for when your Move Particles module is cut-off by a sink.